In order to provide you with further information, our blog writers contribute here weekly to answer any additional questions you may have. Click on a blog title to view its content. 1.Where is the property located? This helps us confirm that the property is in our service area, which is approximately an hour and a half radius from our Monmouth County headquarters. 2.﻿Where is the oil tank located on your property? This is crucial to defining the level of effort, and hence the cost, for your oil tank removal. For example, we typically use a “mini” excavator that’s 5’ 8” wide to physically extract the oil tank from the ground. We must assess how we’re going to maneuver our machine into optimal position for the oil tank removal. If we can’t get the machine where it needs to be, then we’ll have no choice but to do it the old-fashioned way, “manual extraction” with our finest-in-the-industry, certified shovel operators! In the next post of the Oil Tank Removal Cost series, I’ll address the next set of questions I’ll ask you to help provide a cost estimate for your oil tank removal – What is over top of the oil tank? Do you know the size or the contents inside of the oil tank? And a few others. Renova’s core competency is as an environmental remediation contractor. Environmental remediation is defined as the cleanup of pollutants from environmental media, including soil, sediment, groundwater, and surface water. In addition, a remediation project can be done in a number of different ways. Renova is most adept at soil remediation via the excavation and disposal of contaminated soil. For the majority of sites, it is the most effective method for soil remediation. Soil that is determined to be contaminated is removed from the site and transported for offsite disposal. Following the removal of contaminated soil, the area is backfilled with certified clean soil. Thermal desorption is the process of heating up the subsurface in order to mobilize/volatize contaminants, which are then extracted. In a typical case, contaminated soil is heated by thermal conduction from heated metal pipes installed within the contaminated area. An extraction system will then remove the contaminants and vapors from the ground. From there, the collected vapors and fluid are separated, treated, and discharged. In-Situ Chemical Oxidation (ISCO) remediation involves the treatment of soil and/or groundwater through the introduction of chemical oxidants which destroy contaminants. Strong chemical oxidants are either mixed into the soil or injected into the contaminated area. ISCO is most commonly used to treat organic compound contamination. “Pump and Treat” remediation is the most common method of groundwater remediation utilized here at Renova. Contaminated groundwater is removed from the subsurface and then pumped through a treatment system which removes any contaminants. Bioremediation is a quickly advancing alternative remediation approach, with a wide variety of remedial strategies. Microbial remediation is of the most widely used and well-studied approach; bacteria, fungi, or algae are used to degrade hydrocarbon contamination. Another quickly developing bioremediation method is phytoremediation, which utilizes plants to remove contaminants from soil, water, or the air. Of recent note is the use of sunflowers planted near the area of contamination surrounding the Fukushima Daiichi nuclear plant in order to absorb radioactive heavy metals. The Environmental Remediation landscape in New Jersey is one of constant change. The means and methods, the clean-up standards, and the way the NJDEP manages contaminated sites have evolved over the last 10 years. I entered into the environmental world as a young scientist in 2009 straight out of college with very little understanding of the field. Since that time, I have worked for 4 amazing companies, finally landing at Renova in 2018, and throughout my career, I was able to witness many of these changes happen in front of me. For example, probably the largest change in the environmental landscape in New Jersey over the last 10 years has been the adoption of the Licensed Site Remediation Professional. A Licensed Site Remediation Professional (LSRP) is an experienced environmental professional that is licensed by the State of New Jersey to oversee environmental investigations and remedial actions in NJ in accordance with applicable rules and regulations. The LSRP program has streamlined site remediations across the state of New Jersey, allowing individual sites to get immediate and continued attention from a case being opened to issuance of a Response Action Outcome. As an environmental contractor, this has both positive and negative impacts. On the positive side it allows for decisions to be made on the fly during the remedial action phase without waiting for approval from the NJDEP. It also has vastly improved coordination between contractors, clients, and consultants involved on jobs. The adoption of the LSRP has had some negative aspects as well. Unfortunately, no two LSRPs are alike and often what was allowed on one site may not be allowed on another site. As a contractor this often leads to a situation where the planned execution for a job needs to be completely rehashed to satisfy the differing views of the LSRP. Overall the adoption of the LSRP program has been a great success, as we have been able to work with them effectively. The streamlining of the entire cleanup process has benefited clients, consultants, contractors, and the NJDEP. Without the implementation of this new program, many of the most successful cleanup projects in New Jersey would have not been possible. As an environmental contractor, Renova is mostly known for our work performing oil tank removals, site remediations, soil sampling, and other work related to environmental cleanups. However, occasionally we get a project that is a bit outside of our routine services and challenges us to perform work that wouldn’t normally be considered under the umbrella of environmental services. 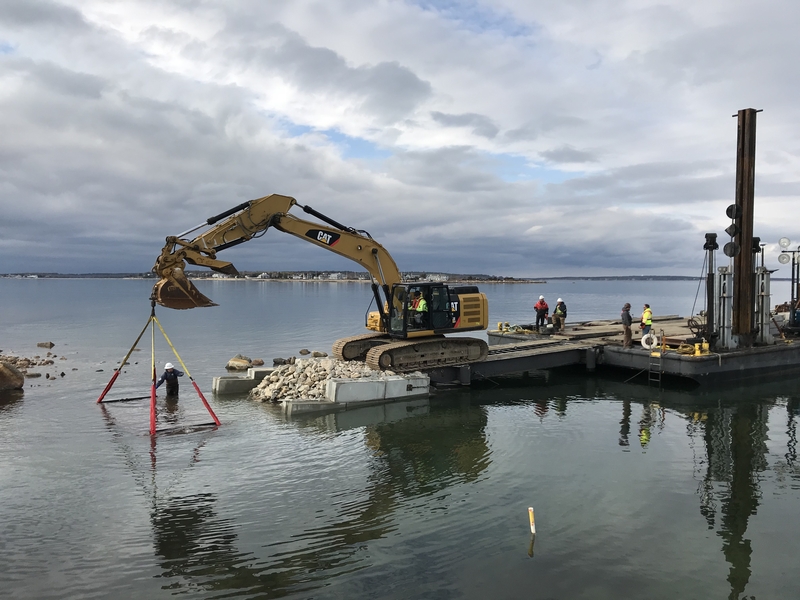 In the summer of 2016, Renova completed work on a contract for the US Army Corps of Engineers (USACE) to decommission monitoring wells that had been installed throughout Floyd Bennett Field, part of the Gateway National Recreation Area in Brooklyn, New York. The wells were previously installed by a separate contractor to monitor groundwater throughout an area of petroleum contamination. As part of the petroleum spill, multiple historic buildings, dating to the early 1900’s, had to be demolished to remove the contaminated soil underneath. To pay tribute to these buildings and the important role they played during Floyd Bennett Field’s time as a Naval Air Base during WWII, Renova’s contract with USACE was extended to create an exterior wayside exhibit that would inform the public about the area’s historic past. 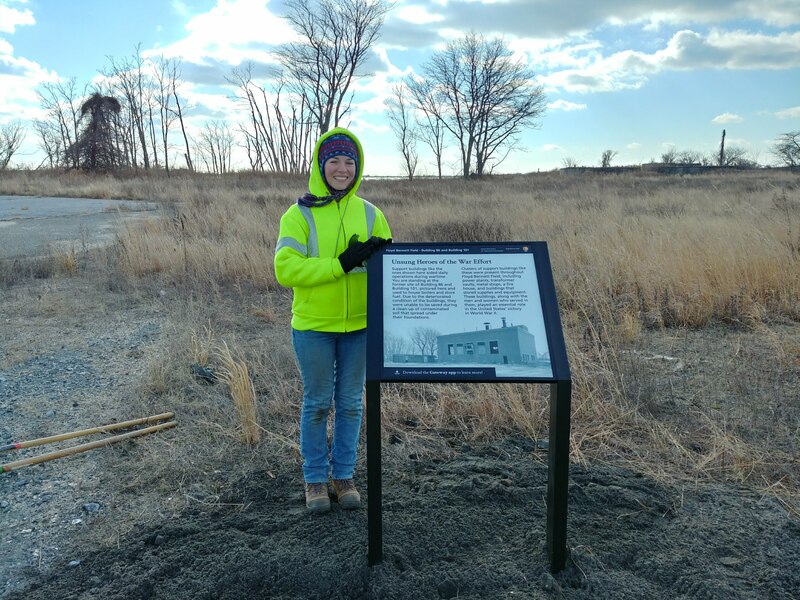 After researching the history of Floyd Bennett Field, we were tasked with designing, constructing, and installing a trailside exhibit that is pictured below and can be found today as you walk around the park. 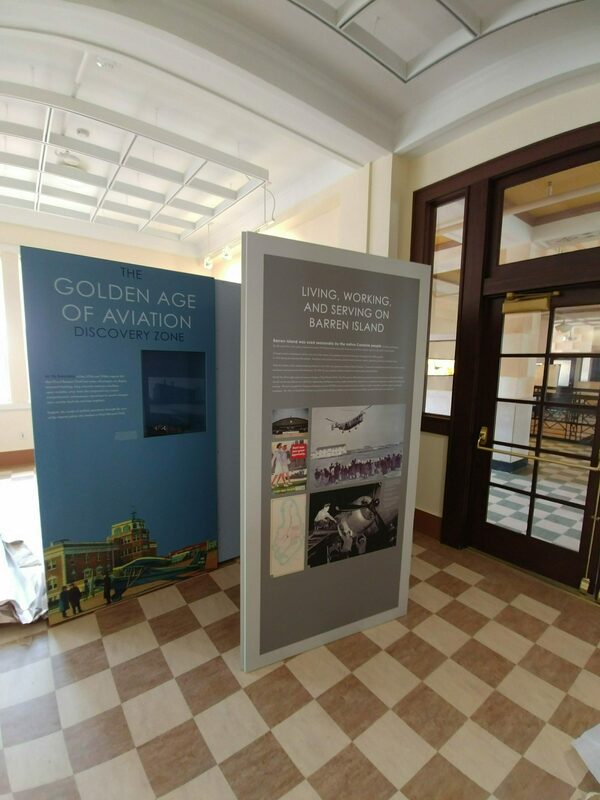 In addition to the exterior sign, we designed and installed a three-sided interior exhibit, also pictured below, for park guests to learn more about Floyd Bennett Field’s many uses throughout time. As an enthusiast of national parks, history, and graphic design, this project ended up being right up my alley and I was grateful for the opportunity to integrate some of my personal interests into my work. There’s no doubt about Renova’s expertise when it comes to heating oil tank removals, site remediation, soil and groundwater testing and treatment, but occasionally, we get confronted with a project without contamination concerns. 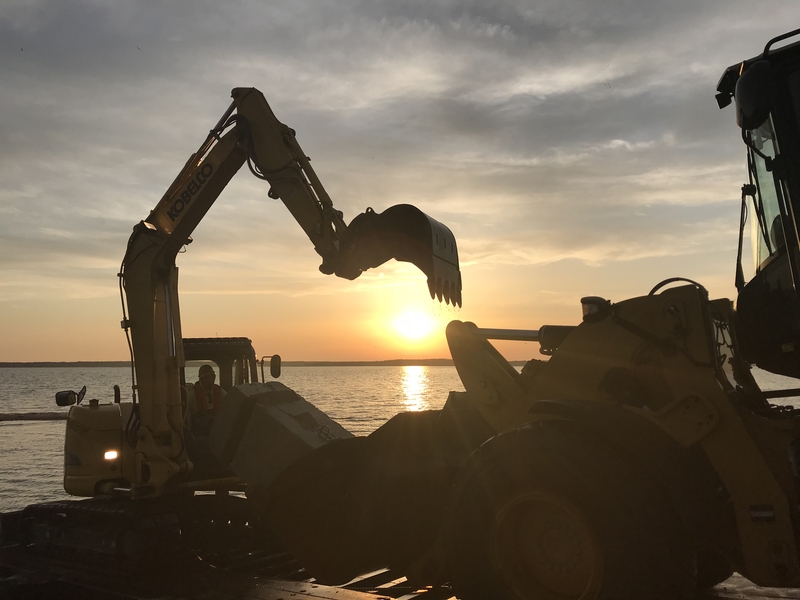 In March and April of 2018, Renova was hired by the U.S. Army Corps of Engineers to provide environmental and marine construction services to save Bird Island. 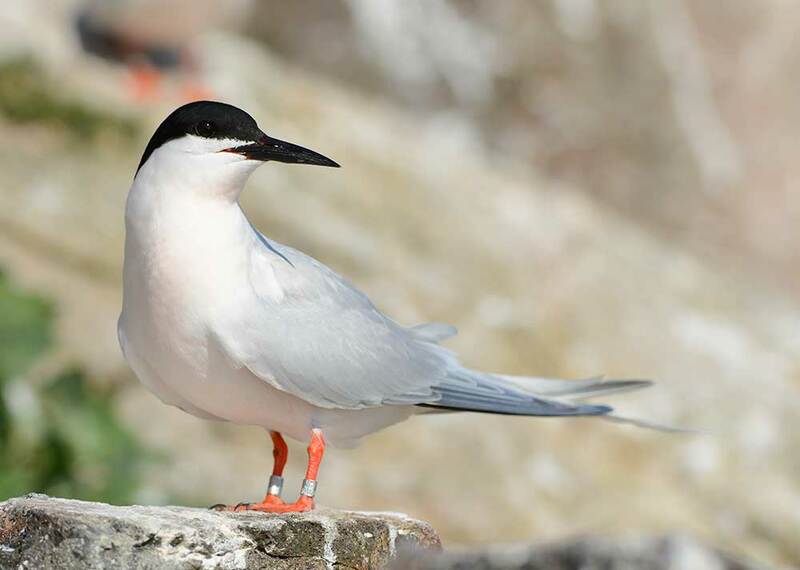 The one-acre, flood- and erosion-devastated island is the nesting habitat of one of the largest populations of federally endangered Roseate Terns in the country. 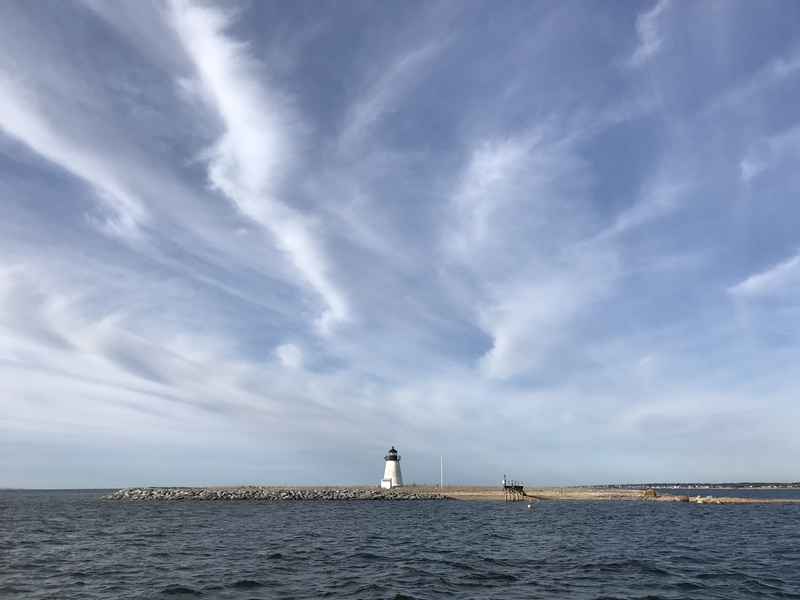 Located in Buzzards Bay off the coast of Marion, Massachusetts, Bird Island experienced significant flooding and erosion after Hurricane Sandy, removing a large portion of the very specific sand blend the terns use for their annual nesting. The terns nest by burrowing down into the sand creating a small divot, and lay their eggs there. Due to the shallower water table after the storm, these divots would fill up with water, drowning the eggs and further endangering the species. Projects by other organizations in the past attempted to mitigate these issues, but the island needed more help. This is where Renova comes in. 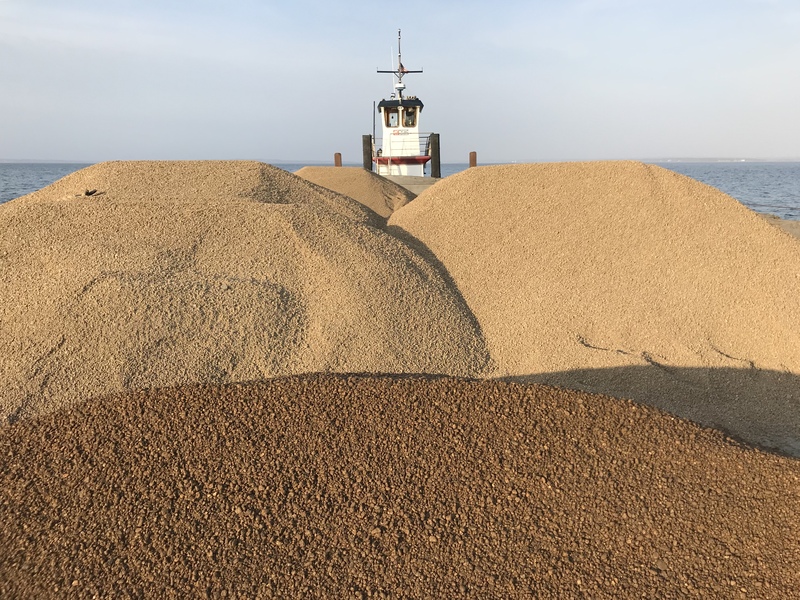 Using a barge, our job was to bring over a total of 1,873 tons (or 3,746,000 lbs) of a specially developed sand blend to reinforce the natural infrastructure of the terns’ habitat. Since Bird Island is so small, with the only real structure being the historic Bird Island Light, there is no access to the island other than an old wooden pier. 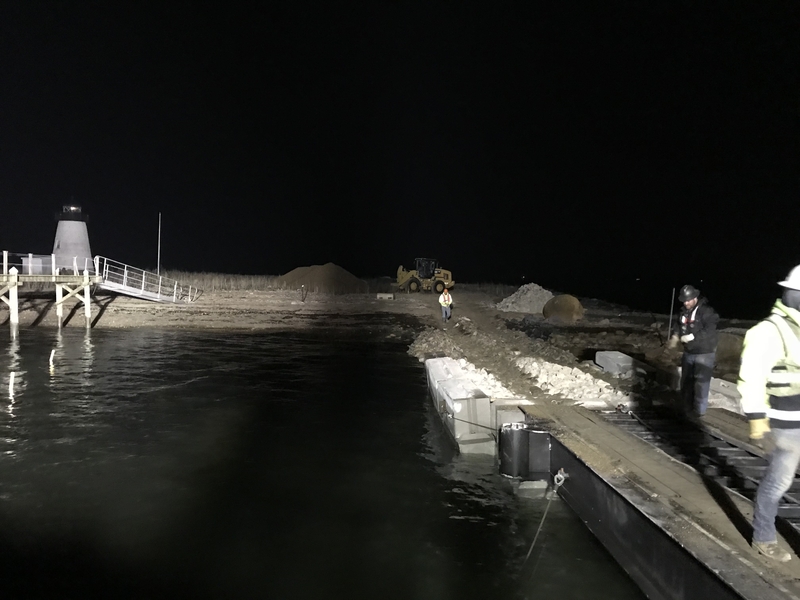 Accordingly, part of our job was to construct a ramp in the bay to support the heavy machinery needed to transport the new material. We mobilized to the site excited and prepared to get started with the ramp, until we encountered a minefield of boulders sitting precisely where it, and Renova’s barge, were supposed to sit. If not removed, the boulders would have punctured our barge, literally sinking the entire operation. Renova ended up spending an unanticipated additional 14 days removing the boulders before beginning ramp construction. A crucial point to note about this job is its schedule. We had a hard deadline for completion: the day the terns return to Bird Island after spending the winter in warmer climates. To make that happen, Renova worked overtime through all weekends and only took days off if the wind or waves were too severe for the barge to function safely. We were understanding of the weekend work, knowing the complex task at hand and quickly approaching deadline; the truly challenging part to get used to was working with the tides. Since the work was being completed from the barge in close proximity to Bird Island’s shore, we had to maintain a minimum depth of water beneath us or our barge would beach itself until the tide returned. To prevent this, we were only able to work during the high tide times. Calculating for high tides meant our shifts would begin at a different hour each day, and at odd start times, such as 2:00 PM or 2:00 AM and everything in between. Once all of the boulders were removed we were able to construct the ramp. The ramp was made of concrete blocks sitting on the bay floor and filled in with stone to provide a solid surface for our machines to get onto Bird Island. Our loaders traversed that ramp countless times until all 3.7 million pounds of the special sand was stockpiled on the island. As we made significant progress spreading the stockpiled material, we began to notice the results of our labor. The terns started to return to their island at a faster pace than we could have imagined! By the time we finished the island looked beautiful and the Army Corps was more than satisfied with our work. The Bird Island job was unlike any project Renova had previously; the opportunity to protect an endangered species was definitely new and interesting. Although it was grueling at times, we were able to persevere and get the job done against oftentimes adamant opposition. I like to think that the birds were our real client, as opposed to the Army Corps, because they are the true benefactors of our labor. I’m grateful to have had the opportunity to contribute to such a unique and meaningful project and look forward to the next new experience!